Balquhidder, ancient rallying place and war cry of Clan MacLaren. 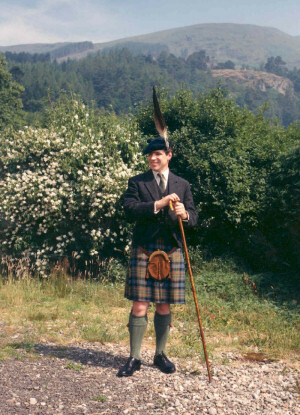 Donald MacLaren of MacLaren and Achleskine was born in 1954 and succeeded his father as Chief in 1966. He is the twenty-fifth head of the Clan since Labhran, name-forefather of the Clan eight hundred years ago. He is descended from King Lorn Mor of the fifth century. Donald was educated at the Dragon School in Oxford; Trinity College Glenalmond in Perthshire, where he learned to play the pipes; and Edinburgh University, where he took a MA Hons. degree in Classics and English and played rugby for the combined Scottish Universities XV. He joined the Foreign and Commonwealth Office in 1978. After postings in Berlin, Moscow, Havana, Caracas and Kiev he served in Tbilisi, Georgia as Her Majesty's Ambassador. He left the FCO in 2008 and now runs a partnership teaching people to speak persuasively called Perfect Pitch. Donald married Maida Jane Aitchison in 1978. They have three sons and two daughters (Donald, Florian, Louis, Iona and Marina) and a grand-daughter (Anna). Their eldest son, Donald, has served with the British army in Iraq and, as a Royal Marines Commando, in Afghanistan. The Chief's home is Kirkton, Balquhidder in the heart of the ancient duchus, the special patrimony of the Chiefly House of Clan Labhran.